The 2018 growing season produced some incredible fruit in the vineyard and the resulting wines really showcase this fact. These tastings are your opportunity to be the first to taste, evaluate and purchase them at a deeply discounted price. The 2018 vintage wine “futures” are offered at a 30% discount to Clan Club members and 20% discount for non-members. Most of these wines will be available by early summer. We contact everyone when the wines are bottled and ready for delivery or pick-up. Each tasting is limited to 30 people, so give us a call today and reserve your seat! Each tasting is conducted in our candlelit barrel room and lasts for approximately one hour. John McGregor leads the group through the line-up of wines and discusses each wine in detail. Reservations are required and this event always sells out, so make your reservations today! In order to secure your seats at this event payment is due at the time of reservation. Cancellations are only refundable up to one week prior to your scheduled seating. The winery will also be open for regular tastings during the event. 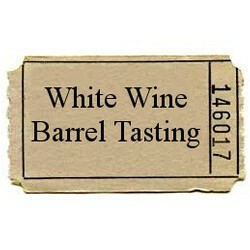 Please try to arrive no earlier than 15 minutes prior to your scheduled tasting.